This is Moses (because he loves water), he is an 8 year old man. His breed is Lab/Retriever. We adopted our dog from a man going to assisted living. The man cried as we drove off. We felt so bad like we was stealing him! The man was able to visit on Friday and he did for about a year. He had interviewed quiet a few couples before us. We are not sure why he chose us. He likes chasing cats and fetching a ball. Moses was very sick due to an allergic reaction to heart worm medicine. He was in the dog hospital for 3 days. This cat lives there and would rub and lick him. Moses would look up at us too sick to move with that look like would you get this cat away from me. 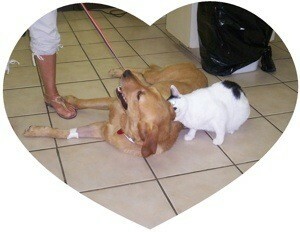 The vet said the cat administered to the very sick animals and they gauged how sick by how the cat reacted. They said that, according to the cat, Moses had been very sick but that he was getting better in this picture. We had to keep him inside and quiet for 6 weeks after he was released. He is doing OK now. He tires quicker but still loves to chase the cats. Oh how sweet. Glad Moses is doing well. Now in this pic is this the cat at the Vets? What love. Animals really do so much for us too. Moses is lovely. I've heard about cats like that. She's blessed and is the vet for having her guidance. My cat isn't a devil but she'd like to be. What a beautiful story. Broke my heart reading about the gentleman you adopted him from. God Bless you for taking such good care of Moses and I'm so glad he's doing better now. What a great story! Thanks for sharing this with everyone. You should polish this up, lengthen it a little and send it to a pet magazine. Everyone loves a "feel good" story!